Between July 1873 and August 1874, two grandsons of Louisa Jane Williams wrote to the 5th Earl Stanhope asking him for more information about their grandmother's (and her sister Elizabeth's) parentage. The men, living in two completely different countries - England and India - had both been told through a 'family tradition' about the 'affinity' between William Pitt the younger and the Williams sisters. In July 1873, C.T. Moberley-Bell Esq., a maternal grandson of Mrs David (Miss Louisa Jane Williams), first wrote from his address in London to Earl Stanhope at Chevening Estate. Stanhope responded quickly to Bell in July 1873, writing that he heard about the tale elsewhere, but it "never attained any general circulation." Stanhope emphatically tells Bell to let the matter drop. Clearly, Stanhope was aware of the assertion, but he was unwilling to give any more information about the Williams' sisters parentage. The 5th Earl Stanhope was born in January 1805, making him only a year old when Pitt died in 1806, but it's obvious from what he writes to Bell that this 'tale' was circulated privately throughout his family. Louisa Williams went to Malta to be married in 1807, and Lady Hester Stanhope permanently left England around the time Earl Stanhope was five years old, so he did not personally ever know his aunt or the Williams sisters. It seems Stanhope's entreaty for Bell to drop the subject was not enough to quench Bell's curiosity. Moberley-Bell responded to Stanhope, again in July 1873, telling him that this information was widely known in his family, and that he was aware of a cover-up. An 'informant' told Moberley-Bell that this information regarding the Williams's sisters true parentage was suppressed. He writes that “my informant - who I regret to say was a connection of my family - distinctly stated that in an interview with your Lordship [Stanhope], I think about two years ago, you not only admitted the truth of the story, but supplied the name of the lady in question, adding that it had appeared in the original edition of your work, and been suppressed in subsequent editions at the request of the W- - - - family.”  Who was the 'W' family? The declaration that Pitt potentially fathered illegitimate children would have been shocking news. It is hard to believe that Stanhope could have conveniently forgotten where he heard the story given its nature. Perhaps he was concealing information from Mr. Moberley-Bell in order to keep it hush-hush? It definitely seemed as though he wanted the matter dropped. One grandson writing to Stanhope regarding the parentage of the Williams sisters is enough, however the very next year another grandson of Mrs. David (Louisa) also wrote to Earl Stanhope asking the same questions. Major C.D. Dodd wrote from Bombay, India in August 1874. Major Dodd seemed to believe that there was a connection, but he was unaware of what that connection was, between Lady Bankes and the Williams sisters. Again, Stanhope writes back to Mr. Dodd telling him to drop it, and unlike his cousin Mr. Moberley-Bell, Dodd acknowledges what Stanhope says, and the matter is consigned to oblivion. In the absence of more information - which may or may not still be out there - we can only guess what the actual truth may have been. Elizabeth Williams never married or had any children. What is particularly intriguing is that two different grandsons of Louisa Jane, and clearly other members of the family, including an 'informant,' believed that Pitt was the natural father of the girls. 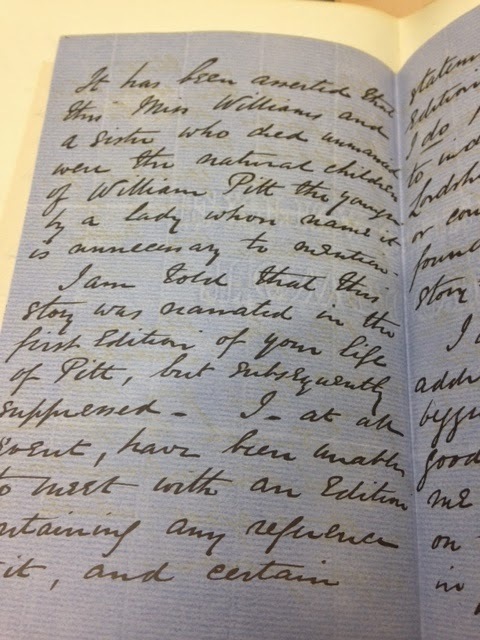 The lady in question was never directly named, although it appears that the grandsons of Louisa Jane Williams knew her name despite the fact that they do not directly name her in their letters. Also highly interesting is the fact that Stanhope openly admitted to Bell that he knew of the tale. This indicates that it was known by other members of the Stanhope family. If this report is true, that Pitt was the natural father of the Williams sisters, it completely contravenes traditional theories on the life - and particularly the sexuality - of William Pitt the younger. It is my intention to continue this investigation by examining Lady Hester Stanhope's physician Dr. Meryon's papers at the Wellcome Library. I'm interested in exploring other mentions of Lady Bankes, and anything else which may come to light. Coincidence, or something much more? 1. Kent History & Library Centre. Stanhope of Chevening Manuscripts, Pitt MSS: U1590/C378, HMC ref. 703/14, C. T. Moberley-Bell to Earl Stanhope, July 1873. 3. Kent History & Library Centre. Stanhope of Chevening Manuscripts, Pitt MSS: U1590/C378, HMC ref. 703/14, Earl Stanhope to C.T. Moberley-Bell, July 1873. 4. Kent History & Library Centre. Stanhope of Chevening Manuscripts, Pitt MSS: U1590/C378, HMC ref. 703/14, C.T. Moberley-Bell's response to Earl Stanhope, July 1873. 7. Kent History & Library Centre. Stanhope of Chevening Manuscripts, Pitt MSS: U1590/C378, HMC ref. 703/14, Earl Stanhope's final response to C.T. Moberley-Bell, July 14, 1873. 8. Kent History & Library Centre. Stanhope of Chevening Manuscripts, Pitt MSS: U1590/C378, HMC ref. 703/14, Major C.D. Dodd to Earl Stanhope, August 1874. 9. Meryon, C.L. (1845) Memoirs of the Lady Hester Stanhope: As related by herself in conversations with her physician, Volume 1. p. 181. Thank you, Therese! I suppose the next port of call is to have a look at Meryon's papers on Lady Hester Stanhope at The Wellcome Library, and to have a closer delve into Hester Stanhope's papers at the Kent History & Library Centre. It would be great if you could identify who Hester meant by "Lady Bankes". I very much doubt it was Frances Woodley, who was not only just plain Mrs Bankes (not Lady), but had also been dead for several years when Hester wrote her letter - though of course it's possible Hester didn't know that. I don't think there's actually any connection between the "Miss W" anecdote and the mysterious "Lady Bankes", to be honest. But who knows what your researches will throw up! It's difficult to know without looking into this further. I definitely have so much more manuscript research to do! Of course, Frances's younger sister was also a Miss W (Harriet Woodley), and she was still alive until 1844. She married Mr. Thomas Pickard, so the 'Lady Bankes' could not be her, either. Of course, it doesn't rule out that the 'Miss W' was Harriet. Very interesting research! Do you know that Moberly-Bell (full name: Charles Frederic Moberly Bell) was a prominent journalist, who eventually became managing editor of The Times of London? There is an article about him in the new edition of the Oxford DNB, complete with references to published and archival sources. I have a feeling that he must have kept more detailed information about his grandmother's parentage, somewhere in his papers. Perhaps you could inquire at The Times concerning the whereabouts of his papers, if they have been preserved? I tend to be rather skeptical about these scandalous unproven stories of exalted parentage, but I have to confess that there does seem to be some deeper mystery here to be uncovered. Who knows what secrets lie in hitherto unread letters and journals hidden deep in the archives??? Thank you, Rachel! There definitely appears to be more than meets the eye. I hesitate with this sort of thing as well, but I keep finding little pieces of information which seems to connect the girls to Pitt. They weren't merely Lady Hester's servants as I have find information in the Chatham Papers at the PRO that indicate Pitt was paying for their upkeep from at least 1797 (6 years before Lady Hester came to live with Pitt).